Public relation (PR) is the manner by which individuals, firms, and organizations communicate with the public. With this definition, a PR specialist is a person responsible for communicating directly and indirectly to create a positive and strong image to the public. Aside from press releases, public appearances, and newsletters, the use of social media is the newest trend in connecting to the intended audience. Of course, before you go social, make sure to consult SEO consulting services for you to achieve the desired outcome. This is one of their expertise. Strategically speaking, there will be a big difference when it comes to the outcomes of public engagement once you go social. Knowing that there are thousands of people who use social networking sites every day and considering the fact that humans are curious in nature, the possibility that the people who will get themselves involved in your PR is high. Like doing public appearances, there are several advantages when you use social media in your PR efforts. By doing so, you may also learn a lot of things that only social media can teach you. Well, there is no harm in extending your niche and going social. Digital experts would say the more popular you are, the more popular you’ll be. Have you ever noticed that in the social world, the more people gets to see a particular post of yours, the more likes and shares that post gets. Perhaps, people have this perception that since a lot of people had already liked it, they will (or might) also like it. They change the way they act to fit in. It is a mob mentality. As a PR specialist, you have to be observant and keen enough about how people engage with your posts socially. If you know that this is the usual behavior of the majority of the netizens, it is your responsibility to grab that chance and turn that to your own distinct PR advantage. When you create an interesting and engaging speech or any other type of content for that matter, more and more people get curious on what you are up to next. What the company wants to do that the public might benefit from? What are the issues of the company that they want to address and clarify? What will they – the public – get when they try to engage in your PR? These are the usual questions that netizens would like to ask before engaging. Try to grab their interest. When you do, you are actually establishing a community of your own with people who will deeply engage with your brand beyond a simple like or share. The secret is to build a permission asset. When you use social media for your PR, expect that people would want to know more, more than what you have just presented to the public. They would want to engage and be involved personally especially after knowing what the company wants to do and how they may contribute. Perhaps, they recognized you based on the impact of every word you said to them. Simply, that particular person who wants to get involved more is paying attention to what is yet to come. They want you to disclose more about the things that you have not tackled in the public. Remarkably, when one is interested in you and in the company or organization that you associate yourself with, they will send you a private message regarding the matter. You have to understand that the attention that they have given you is precious and you have to seize the opportunity before they change their minds. With that, you have their permission to share more about what the company or organization wants to impart to the public. There are also instances wherein a particular person would want to actively get involved in your company’s advocacies, you also have to grab that chance. You don’t know it, but that person can be one of your company’s future assets. Also, it is another way to create a strong and positive impression on other people. When you do PR socially, of course, you use links to connect to the site where your content is. Sharing your content is one of the important things that you must not forget to do on social media. Sharing your content is one way to make the people notice your company and what it has to say. Actually, a lot of PR specialists uses social media sites as their platform to connect with their intended audience. But only few PR specialists have succeeded in sharing their sites and gaining thousands of people who engages with their site. How? They incorporate SEO in their PR. SEO plays a big role in making your website known to the public. SEO helps your site to land on the top ranks of the search engines. The higher the position, the better the public engagement to your site. Nonetheless, there are standards and best practices to follow to maximize your SEO results. A great (unique and informative) content that is written with the public in mind is just one of these. Using social media for PR does not end in telling and letting the people know what you or your company or organization is up to. If you know how social media can further boost your website’s popularity, for instance, you must take advantage of this, too. It is your leverage to further build your community. Social media is capable of disseminating information all over the world. Thereby, when you have a good reputation in the social media, you are attracting and inviting more investors, advertisers and other entities that are willing to support you and your company. Grab those opportunities as well. These will not only enhance your popularity, but they also attract partnerships and other worthy affiliations. Definitely, you might be facing more investors who are also willing to work with you. On the other hand, there will be people who are not in favor of doing PR in social media. They don’t like the way you deliver your message to them or that they get annoyed when you try to share your message in all social media sites. There could be other concerns that don’t impress your intended audience. Thus, you have to be careful and responsible in every post that you publish. Well, basically, that’s what PR specialists do. Analyze, analyze, analyze and then, decide on the best possible solution to clarify unwanted issues. Let me start by saying whether you are doing SEO in Manila or Cebu, the web is a jungle! The Internet aims to level the playing field in terms of promoting the brand and building a customer list. At times, you’d think that it is not made for small businesses no matter how much it tried to treat all natures, scopes and sizes of businesses equally. Small business owners usually find difficulties navigating their way to the top, at least online, as they compete with attention. These businesses typically work with a very limited budget. Gaining real traction in both organic and paid results can be daunting. Unlike those giants which seemed to dominate the search engine results pages (SERPs). If you are a small business owner, what will you do? Don’t lose hope. Ever heard of barnacle SEO? Well, the idea behind such is easy to understand. 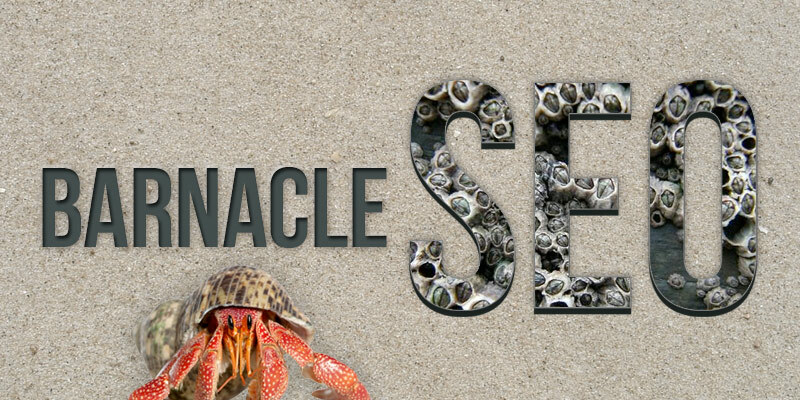 Let’s take a look at what barnacle SEO is and what it can do to your business. Barnacle SEO is not in its infancy. Will Scott coined the term in 2008 to replace a somewhat derogatory term ‘parasite SEO.’ Fundamentally, the concept relies with digital landscape reality wherein larger websites can rank high and obtain traffic while smaller sites often lag behind, getting lost on the sea of results. Barnacle SEO, while most websites define it as a process, for yours truly, it is an opportunity to attach the smaller website to a larger website. We refer to Yelp, Better Business Bureau, Angie’s List, Yellow Pages, Google+, Trip Advisor, etc. as larger websites. Smaller websites can use these sites as a necessary vehicle so they get noticed and included in the top spots of SERPs. If someone will search for ‘SEO packages in Cebu,’ an independent site may not necessarily appear in the first page. However, a listing in Yellow Pages may make it on the first page. The independent site attaches itself to a large site thus improving the odds of being found. Barnacle SEO is mostly applicable to small businesses operating locally. It involves profile or business page optimization on well-trusted and high-ranking sites. This means small business owners like you just need a website – your own website – to make the strategy work for you. There is thereby the strategic fit with your limited digital marketing budget. Barnacle SEO must be a staple of your local campaign. According to Search Engine Land, Google Hummingbird seemed to favor Yelp and other business directories. In another study, Yelp is a prominent result among mobile search queries wherein 37.3% of clicks go to the profile page in Yelp while 51.8% go to Yelp profile and category. Sites like Yelp builds brand equity. The sites are well-known and oftentimes, only real businesses are listed on them. They also provide better answers. Consider this, users are looking for information about your business and these might be buried deep into the site (i.e. the Contact Us page). Unlike content listings that straightforwardly include operating hours, menus, amenities, etc. Perhaps, this is also the reason Google ranks these sites high on SERPs as they provide better answers to queries. Business listings and directories are the big ships online, so you should barnacle on them. Before you can become a successful barnacle, you must know which sites you should be attaching yourself to. As you may know by now, not all sites are created equal and so are the larger sites. Some sites rank higher in specific industries. Find the most applicable sites to attach yourself to. Start by doing a keyword search. Choose those sites with the most consistent results. Attach your site to these sites. Prioritize those sites that appear higher on SERPs when you search for a particular keyword. Next, create a business profile on your chosen sites. Claim the profile as if it is the only business on your category or niche. Treat the profiles as an extension of your business. Rule of thumb: make sure that the information on all your profiles is accurate and consistent specifically the contact details. This is critical since a slight difference in the business address, for instance, can confuse Google and other search engines. Take the time to upload images especially your company logo and others that show off the business like maps, galleries or menus. Some sites allow customization of the profile page. Make your profile appear like your own website. Think about visual branding. These are the major conversion points for your prospects. Optimizing your profile to maximize the results is necessary. First, you need to submit your information in Google Places. A brief yet compelling description of the business must be apparent including a list of your product and service offerings. Include the basic info and the links to your website. Make sure that the links are working. Test them. When creating business description copies, the SEO world is divided whether to optimize the description including keywords or not. Basically, small business opts for barnacle SEO because it cannot pay for high-competitive keywords. You may put your primary keywords on the description without being too blatant about it. Simply, integrate the keywords as organic as possible. Majority of the sites welcome customer feedback. Encourage your customers to provide reviews and testimonials on the site. The review profile leverages your online presence and visibility especially on the results pages. Barnacle SEO is processual which means results are not immediate. It will take a few weeks or even months before you can observe changes. However, the results are always worth the time, effort and (minimal) money that you have invested in it. Getting noticed may be hard at first. Barnacle SEO presents itself as a high-ROI strategy for small business. Leveling a playing field indeed! To become a barnacle or not? This is the most pressing issue here. Anyhow, creating with the help of web companies in the Philippines is easier. Your concern should be providing real answers to your prospects when ranking high on search engines is difficult at the moment. Caveat: There are SEO consultancy firms that can help you decide whether barnacle SEO is appropriate for your business or not. These firms can also provide you with options of strategies so your rank higher on SERPs on the price specifically created for small businesses.